You can also pick up our 2019 Events & Deals Calendar at a major discount! The calendar includes more than $75 of valuable coupons from Airosphere, MOSI, Tampa Tarpons and many more! Join Family-Friendly Tampa Bay at our 2019 Events & Deals Calendar Launch Party! 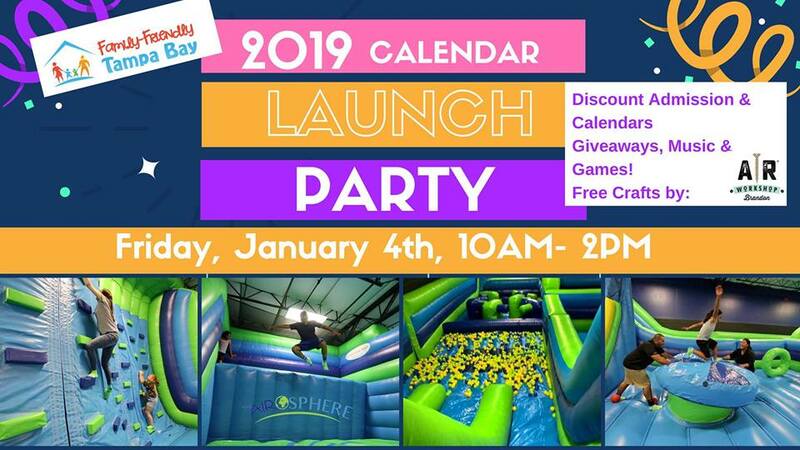 The party takes off on Friday, January 4th from 10am-2pm at The Airosphere, an inflatable Amusement Park in Tampa that is brimming with fun for the whole family. All ages are welcome to attend. Register to reserve your Party Pass Coupon for 90 minutes of jump time for only $14.95 per jumper. (That's a savings of of over $7) Please bring a copy of your Eventbrite ticket to receive the discount on jump time. +Giveaways, Music, Games and more! *Cheat Sheet to monthly deal alerts to save you money! * Entry into our VIP Group so you won't every miss a great event or deal! PLUS...a portion of our proceeds will be going to Color Me Abstract a 501(c) (3) non-profit organization in Pasco County that focuses on helping families. Reserve your calendar today for only $10 and pick it up at the event or purchase the calendar at the event. We can't wait to see you at the event! Make sure to register to attend on Eventbrite to claim the Party Pass Coupon!